Hurricane Florence continued to weaken Wednesday night, being downgraded to a Category 2 storm. Florence is just under 300 miles off the coast of the Carolinas with sustained winds of 110 mph, and gusts of 130 mph. "(The downgrade) was very unexpected. Just a major, major change," Severe Weather Team 2 Chief Meteorologist Glenn Burns said. Burns said a tremendous amount of wind shear is now interacting with the storm, shutting everything down. He said the storm will remain a Category 2. Watch Channel 2 Action News for the latest updates on Florence. The storm could possibly impact Georgia as a tropical low. More than 10 million people are under storm watches and warnings in three states. The storm's outer bands were starting to move in over the North Carolina coast on Wednesday night. The National Hurricane Center said Florence is now forecasted to slow or stall as it reaches the coast, generating winds fueling “life-threatening” storm surge, and producing rainfall causing “catastrophic” flooding. “This is shaping up to be a very dangerous scenario, as Florence nears our coast and stalls, unprecedented, and life-threatening flooding may unfold,” a forecaster for the National Weather Service in Wilmington, N.C. wrote. North Carolina governor Roy Cooper echoed the dire warning. "You put your life at risk by staying," Cooper said. "Don't plan to leave once the winds and rains start." Gov. Nathan Deal announced Wednesday an emergency declaration for all 159 Georgia counties ahead of Hurricane Florence. Burns said the Georgia coast will see tropical storm force winds but they will be moving from land out to sea so there is no surge threat. East Georgia will likely see rain. The rain is expected to move into Georgia late Sunday and will continue through Monday. U.S. Senators Johnny Isakson (R-GA) and David Perdue (R-GA) today urged Georgians to take safety precautions ahead of Hurricane Florence’s landfall. Severe Weather Team 2 is using the most advanced technology in the world to forecast the path of the Hurricane Florence, for updates throughout the day on Channel 2 Action News. President Donald Trump tweeted Wednesday morning urging Georgia to "be ready, be prepared!" The latest advisory shows Florence's maximum sustained winds at 110 mph, with higher wind gusts. the storm is expected to bring life-threatening storm surges and rainfall to portions of the Carolinas and mid-Atlantic states. The storm is moving toward the northwest near 17 mph. Florence is expected to slow down considerably by late Thursday into Friday, and move slowly through early Saturday. On the forecast track, the center of Florence will move over the southwestern Atlantic Ocean between Bermuda and the Bahamas Wednesday, and approach the coast of North Carolina or South Carolina in the hurricane warning area on Thursday and Friday. Carolina coast, and that`s saying a lot given the impacts from Hurricanes Diana, Hugo, Fran, Bonnie, Floyd and Matthew. Florence is expected to produce heavy and excessive rainfall that would produce catastrophic flash flooding and significant river flooding. Hurricane conditions are expected to reach the coast within the hurricane warning area on Friday. Winds are expected to first reach tropical storm strength on Thursday, making outside preparations difficult or dangerous. Preparations to protect life and property should be rushed to completion. A life-threatening, catastrophic storm surge is likely along portions of the coastline in North and South Carolina. Large swells with life-threatening surf and rip currents are also a danger. Channel 2 Action News has multiple crews fanned out across the East Coast preparing for Hurricane Florence. Channel 2’s Nicole Carr traveled to Myrtle Beach, South Carolina on Tuesday, where she found most people had heeded the governor’s warning and left. In what is usually a bustling area, Carr said it was quiet except for the buzzing of drills as people boarded up their homes and businesses. “It almost feeling like a ghost town now,” an evacuee who only identified himself as Aaron, told Carr. Aaron said he was heading to Atlanta to ride out the storm. "We're going to evacuate to Georgia. We heard it's not going to hit Georgia, so actually we're going toward Atlanta." Amir Solice said he was not taking any chances by sticking around. “Last year was a Category 1, 2? And this one is a going to be a 4, so I guess it's going to be bad,” Solis said. 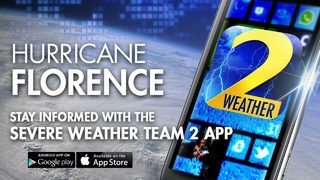 Severe Weather Team 2 Meteorologist Brian Monahan arrived in Wilmington, North Carolina late Tuesday night, where the storm is expected to hit hardest. FEMA Administrator Brock Long warned that power could be out for weeks. "This has an opportunity of being a very devastating storm," Long said Tuesday. "The power will be off for weeks. You're going to be displaced from your home in coastal areas. There will be flooding in the inland areas as well."